This photo is of a bundle of silk. It consists of four ropes of approximately 672 threads that are pre-cut at 105” (2.7 m) long for braiding; they in turn are further divided into 4 sections. The total number of sections in a bundle is 16. The silk is packaged in Japan in this manner so that braiders can easily make obijime (oh-bee-gee-meh) which are the traditional belts, that tie around the obi. The fourth rope, at the bottom of the photo, has been further broken down into four sections which is how BraidersHand thread is packaged; one rope divided into four sections. 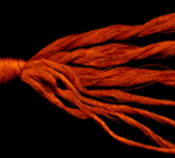 One package of silk has approximately 42 fine threads in each of the four sections for a total of 168 threads. The thread size is 150/3 which is about the same size as 00 silk thread available on small spools in the USA. Imposter has approximately 39 threads in each section for a total of 156 threads. The metallics have approximately 31 threads in each section for a total of 124 threads. A finished braid is usually one-half the length of the threads before braiding. A package of threads if folded in half makes 8 sections, which will be approximately 52" long, the resulting braid will be approximately 26" long. See our Tips page for information on handling the kumihimo threads and for directions for making a drawstring for your counter weight bag or use it for a small treasure bag.